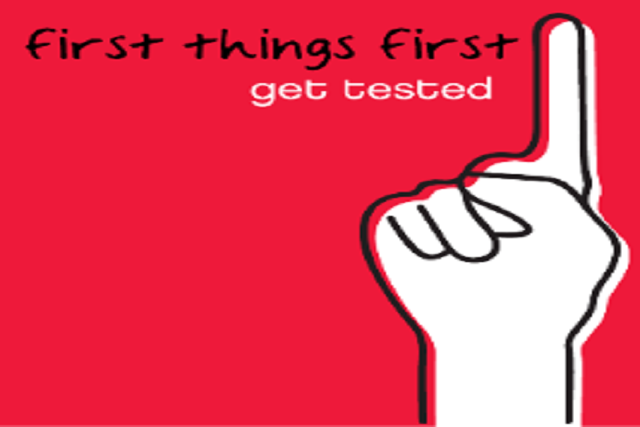 The HIV/AIDS Centre will be hosting its annual awareness campaign ‘First Thing First’. The First Things First Campaign, which has been endorsed by Health Minister Dr Aaron Motsoaledi, is an innovative HIV counselling and education campaign which aims to help South African students fulfil their destinies by encouraging them as future leaders to be responsible, get tested for HIV and empower themselves by knowing their status. 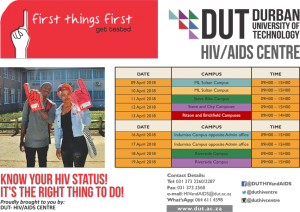 The campaign is largely an HIV/AIDS awareness initiative targeting both staff and students. We are hoping to test a significant number of people within the university. The campaign will cut across all DUT’s campuses (both Durban and Midlands), with different dates for each campus. The dates and campuses are outlined below.